The fourth annual High Fives Charity Bocce Ball Tournament is Sunday at the Truckee River Winery. Two person teams begin tournament play at noon. The Silver Boombox Thief will be supplying music and Full Belly Deli will be catering the food. Team costumes and creative names are encouraged. 40 teams will competed for great prizes and bragging rights. The cost is $100 per team of two. Call 530-587-4453 to sign-up your team. High Fives is a Non-Profit Foundation, based in Truckee. The organization is dedicated to raising money and awareness for athletes that have suffered a life-altering injury while pursuing their dream in the winter action sports community. 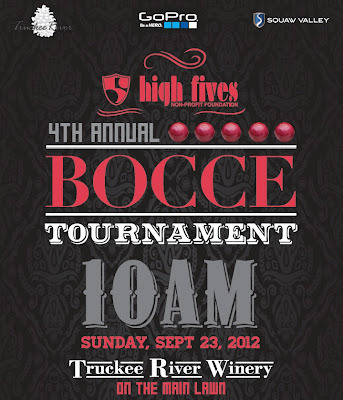 The Truckee River Winery has a Bocce fall league underway now. 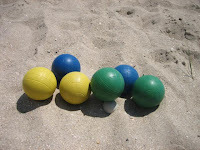 They play games Tuesday or Wednesday evenings through October. The winery’s number is 530-587-2588.